A treatable cause of dementia. As a neurology resident at the University of Minnesota in Minneapolis in 1970, I was fortunate when Dr. Alan Rubens joined the teaching faculty. He had completed a cognitive and behavioral neurology fellowship with Dr. Frank Benson and Dr. Norman Geschwind, who were both giants in that field. The first neurology grand rounds Dr. Rubens gave was on idiopathic normal pressure hydrocephalus (NPH), a disorder characterized by dementia, gait impairment, and urinary incontinence. He was excited about this disorder, which appeared to improve with intracranial shunt surgery, because it was one of the few causes of dementia that was treatable. At the time, senility or Alzheimer’s disease (AD), both untreatable, were considered the major causes of dementia. Specific criteria to make a definitive diagnosis were not completely clear. Radioisotope cisternogram was frequently used to see if spinal fluid was delayed in flowing or obstructed with normal spinal fluid pressure, which led to many individuals having a ventricular or lumbar peritoneal shunt placed without improvement. At the time, gait and urinary incontinence improved more often than dementia. Most individuals with NPH treated with shunts are followed by neurosurgeons to be sure the shunts are working and long-term follow-up by neurologists, including myself, has been infrequent. Not surprisingly then, although I am the director of an AD and memory disorders center, my knowledge of cognitive impairment before and after shunting in patients with NPH was lacking, and so here I review the cognitive aspects of NPH before and after shunting as well as long-term outcomes and comorbidities (eg, stroke, AD, frontotemporal dementia [FTD], and Parkinson’s disease [PD]). For a more detailed approach, the reader is referred to an article by Williams and Relkin1 that covers international and Japanese guidelines. The onset of NPH is insidious, taking place over a period of at least 6 months. Persons with NPH develop a gait disorder with disturbed postural and locomotor features without sensorimotor deficits. Gait initiation failure, shuffling, festination, tripping, and falling are often present; whereas, spasticity, hyperreflexia, and other upper motor neuron signs are not typical. Lateralizing findings are also not typical. Persons with NPH commonly have urinary urgency with difficulty emptying the bladder. Cognitive impairment is usually dementia, which includes apathy, amotivation, psychomotor slowing and features of executive impairment with or without visuospatial abnormalities, impaired receptive or expressive language, or impaired naming not benefited by cueing and hallucinations. Importantly, these cognitive changes often overlap with other neurologic causes of dementia and are not unique to NPH. Most persons with NPH appear to have other conditions contributing to their symptoms and it is uncommon to see pure NPH. Not all persons with NPH will have the full triad of clinical symptoms and signs, although nearly all have gait impairment. The presence of cognitive impairment, urinary incontinence, or both in a person who also has a gait disorder should increase suspicion for spinal cord and other brain disorders that should be ruled out. Helpful testing includes blood studies for complete blood cell count; metabolic profile, including thyroid-stimulating hormone; levels of vitamins D, B12, and folate; and Lyme seropositivity. Neuropsychologic testing to measure signs and symptoms of dementia objectively is useful, as is a urology consultation. Cervical, thoracic, or lumbar MRIs should be ordered. Taking the time to rule out other causes of the clinical features of NPH does not diminish the response to surgery. Trials of treatments (carbidopa/levodopa) or withdrawal of potentially causative agents such as neuroleptics, benzodiazepines, or other sedating agents should be given time to work before testing for NPH.1 It is better to take time for a thorough evaluation, and if the patient improves upon treatment of other disorders, then testing for NPH may not be necessary. Testing for NPH includes a brain MRI and lumbar puncture (LP), and potentially cerebrospinal fluid (CSF) drainage. MRI findings typical of NPH are shown in the Box. An opening pressure in the range of 5 to 18 mm Hg (or 70 to 245 mm H20) as determined by LP or comparable procedure is seen in NPH. Pressures significantly higher or lower are not consistent with a diagnosis of NPH. Draining CSF by LP or spinal catheter is recommended for diagnosis, although the international guidelines also recommend infusion testing. In the typical test protocol, 30 to 50 mL of CSF is drained, and changes of gait and cognition are observed for 30 minutes to 4 hours afterward. It is recommended that the patient remain upright after the procedure because post-LP headaches are unusual in this population. Improvements in gait and cognitive function should be observed but rarely last more than a few days. Infusion testing for assessment of CSF in suspected NPH is done more commonly in Europe. The test infuses artificial CSF (Ringer’s lactate) via 1 spinal needle while simultaneously recording from a second spinal needle.4 Infusion testing requires specialized equipment and considerable expertise to perform. If the response to CSF drainage is definite or the CSF hydrodynamic variables are consistent with NPH, guidelines support shunt placement, but do not favor one type of shunt surgery over another. Adjustable shunt valves offer the advantage of generally being able to lower the CSF pressure until symptoms improve or to raise the pressure settings if low pressure symptoms emerge. If there is a shunt malfunction that leads to worsening of symptoms, 75% of patients will recover when the shunt is corrected. The choice of shunt placement (ventriculoperitoneal, ventricular atrial, or lumboperitoneal) depends on the neurosurgeon recommendation and patient preference. A study of 11 cases9 of NPH used neuropsychologic testing to assess for the presence of dementia and described 2 cognitive profiles for the patients studied. The first group had early and less advanced disease with isolated frontal lobe dysfunction but normal memory. The second group had more advanced impairment with severe global cognitive dysfunction including memory loss. Many other authors have shown cognitive impairment beyond frontal lobe dysfunction to include episodic memory and visuoperceptual and visuospatial impairments.10,11 In a study of 32 persons with NPH and 30 persons without NPH, control groups with detailed neuropsychologic testing showed that those with NPH had dysfunction in all aspects of frontal executive and visuospatial and visual discrimination abilities.12 Another study of 17 persons with NPH and 14 persons without NPH also found deficits in visuospatial but not executive dysfunction, suggesting that visuospatial impairment could be an early sign of cognitive impairment in NPH regardless of global cognitive dysfunction.13 Although a study of 51 persons with NPH showed a pattern of memory loss of the frontal type in which recall is disproportionately affected but recognition memory is spared,11 others12 have found that both recognition and recall are impaired, suggesting that NPH is not exclusively ascribable to frontal lobe function. Both types of memory impairment occur in AD. Other studies have focused on differentiating cognitive dysfunction in persons with NPH from cognitive dysfunction in persons with other neurodegenerative disorders characterized by gait impairment (eg, AD, vascular dementia, Lewy body dementia [LBD], and PD dementia). These studies show that antiparkinson medicines are not efficacious for treating people with NPH. In contrast to those with PD, a DaTscan imaging study with ioflupane (123I), which binds to dopamine transporters (DaT) often has normal findings in persons with NPH. In persons with AD, early stages of frontal lobe abnormalities are infrequent, but all types of memory impairment usually occur; in contrast, recognition memory is often preserved in those with NPH. Cognitive impairment in NPH may be from tangential shear stress that results from intraventricular CSF pulsations to periventricular projection fibers and associated subcortical structures. A diffusion tensor imaging (DTI) study of 24 persons with NPH and 17 control subjects showed that in persons with NPH, the anterior thalamic nucleus had elevated axial diffusivity (DA), fractional anisotropy (FA), and pure diffusion anisotropy.16 These findings suggest that in persons with NPH, the thalamic structures may undergo reactive changes at the synaptic level to compensate for declines in memory performance leading to greater FA. Similar changes are seen in the red nucleus of the midbrain suggestive of synaptic reorganization in the corticorubralspinal tract during motor recovery in patients who have had a stroke. More studies with larger sample sizes are needed to fully understand the pathophysiology of cognitive impairments that result from NPH. In a study comparing persons with NPH (n = 32) with those with AD (n = 30) and those without cognitive impairments (n = 30), detailed neuropsychologic testing was performed in all subjects and in the 26 patients with NPH who had shunts placed (1 year after placement).12 The baseline deficits in persons with NPH included attention, executive function, memory, and visuospatial processing and perception with memory impairment comparable to patients with AD. Significant improvement in executive function was observed in patients with NPH after shunt placement. An important point made by the author in this article was that preoperative diagnosis can be difficult when gait dysfunction can be very mild and cognitive impairments are prominent.28,29 Even though the subjects with NPH were more impaired than those with AD in attention, executive, visuoperceptual, and visuospatial functions, it was difficult to differentiate between the 2 disorders. Frontal lobe impairment accounted for more than 50% of whole cognitive deficits in subjects with NPH, whereas memory impairment accounted for > 50% of cognitive deficits in those with AD. When fluorodeoxyglucose (FDG) positron emission tomography (PET) imaging was done in patients with NPH 3 days before and 7 days after shunt placement, a significant increase in global glucose uptake was seen after shunt placement.30 Clinical status of independence in activities of daily living (ADL), gait, urine incontinence, and cognition were evaluated did not correlate with FDG-PET findings before shunt placement but were seen after shunt placement. Changes in FDG uptake and global cognitive function (measured with MMSE) were observed in 16% (n = 19) of subjects 7 days after surgery. Rapid functional improvements in the absence of the early morphologic changes suggests a prompt metabolic response by neurons that may be related to neuronal plasticity but do not provide prognostic information to help identify who will benefit from surgery. 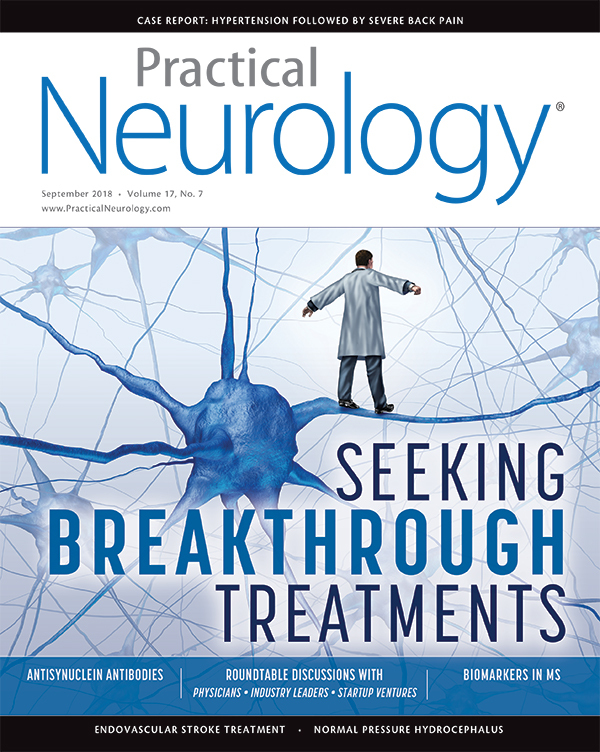 A diagnosis of NPH requires an organized approach incorporating differential diagnosis, treatment of other disorders before specific testing for NPH, MRI imaging, and CSF drainage with frequent neurologic assessments to record any neurologic improvement. If MRI findings consistent with NPH are present, and gait or cognitive improvement occurs within 2 to 24 hours of CSF drainage, referral to neurosurgery for shunt placement should follow. Cognitive impairments in persons with NPH vary and include multiple forms of dementia, including those caused by small vessel disease related to high blood pressure, diabetes, high cholesterol, smoking, and neurodegenerative diseases (eg, AD, FTD, PD, and LBD). Individual variation in neuroplasticity and so-called cognitive reserve may also explain the variability of cognitive impairment in persons with NPH. Some patients with NPH will have worsening of symptoms with other illnesses such as urinary tract infections, hospitalization for any reason, and other surgical procedures, but this usually improves within 2 to 8 weeks. All or some of the 3 major symptoms, (gait, cognition, and urinary incontinence), may improve after shunt surgery; if none of the 3 improve, another cause should be considered. Patients with NPH should be closely followed after shunt surgery as other neurologic disorders are often present, and neurosurgeons may focus exclusively on shunt function. There are no reliable means of assessing disease severity or predicting response to shunt surgery yet. 1. Williams MA, Relkin NR. 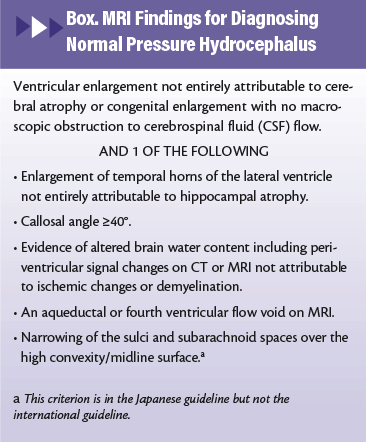 Diagnosis and management of idiopathic normal-pressure hydrocephalus. Neurol Clin Pract. 2013;3(5):375-385. 2. Greenberg BM, Williams MA. Infectious complications of temporary spinal catheter insertion for diagnosis of adult hydrocephalus and idiopathic intracranial hypertension. Neurosurgery. 2008;62(2):431-435. 3. Marmarou A, Young HF, Aygok, GA, et al. Diagnosis and management of idiopathic normal pressure hydrocephalus: a prospective study in 151 patients. J Neurosurg. 2005;102(6):987-997. 4. Eklund A, Smielewski P, Chambers I, et al. Assessment of cerebrospinal fluid outflow resistance. Med Biol Eng Comp. 2007;45(8):719-735. 5. Adams RD, Fisher C, Hakim S, Ojemann R, Sweet W. Symptomatic occult hydrocephalus with normal cerebrospinal-fluid pressure: a treatable syndrome. N Engl J Med. 1965 July;273:117-126. 6. Ogino A,Kazui H, Miyoshi N, et al. Cognitive impairment in patients with idiopathic normal pressure hydrocephalus. Dement Geriatr Cogn Disord. 2006;21(2): 113-119. 7. Tarnaris A, Toma AK, Pullen E, et al. Cognitive, biochemical, and imaging profile of patients suffering from idiopathic normal pressure hydrocephalus. Alzheimers Dement. 2011;7(5):501-508. 8. Mega MS, Cummings JL. Frontal-subcortical circuits and neuropsychiatric disorders. J Neuropsychiatry Clin Neurosci 1994;6(4)358-370. 9. Iddon J, Pickard J, Cross J, Griffiths P, Czosnyka M, Sahakian B. Specific patterns of cognitive impairment in patients with idiopathic normal pressure hydrocephalus and Alzheimer’s disease: a pilot study. J Neurol Neurosurg Psychiatry. 1999;67(6):723-732. 10. Boon A, Tans J, Delwel E, et al. Dutch Normal-Pressure Hydrocephalus Study: prediction of outcome after shunting by resistance to outflow of cerebrospinal fluid. J Neurosurg. 1997;87(5):687-693. 11. Walchenbach R, Geiger E, Thomeer R, Vanneste J. The value of temporary external lumbar CSF drainage in predicting the outcome of shunting on normal pressure hydrocephalus. J Neurol Neurosurg Psychiatry. 2002;72(4):503-506. 12. Saito M, Nishio Y, Kanno S, et al. Cognitive profile of idiopathic normal pressure hydrocephalus. Dement Geriatr Cogn Dis Extra. 2011;1(1):202-211. 13. Bugalho P, Alves L, Miguel R, Ribeiro O. Profile of cognitive dysfunction and relation with gait disturbance in normal pressure hydrocephalus. Clin Neurol Neurosurg. 2014;118:83-88. 14. Savolainen S, Paljärvi L, Vapalahti M. Prevalence of Alzheimer’s disease in patients investigated for presumed normal pressure hydrocephalus: a clinical and neuropathological study. Acta Neurochir (Wien). 1999;141(8):849-853. 15. Golomb J. Alzheimer’s disease comorbidity in normal pressure hydrocephalus: prevalence and shunt response. J Neurol Neurosurg Psychiatry. 2000;68(6):778-781. 16. Morel A, Magnin M, Jeanmonod D. Multiarchitectonic and stereotactic atlas of the human thalamus. J Comp Neurol. 1997;387(4):588-630. 17. Solana E, Poca M, Sahuquillo J, et al. Cognitive and motor improvement after retesting in normal-pressure hydrocephalus: a real change or merely a learning effect? J Neurosurg. 2010;112(2):399-409. 18. Hong YJ, Yoon B, Shim YS, et al. Differences in microstructural alteration of the hippocampus in Alzheimer’s and idiopathic normal pressure hydrocephalus: a diffusion tensor imaging study. Am J Neuroradiol. 2010;31(10):1867-1872. 19. Hattori T, Sato R, Aoki S, Yuasa T, Mizusawa H. Different patterns of fornix damage in idiopathic normal pressure hydrocephalus and Alzheimer’s disease. Am J Neuroradiol. 2012;33(2):274-279. 20. Marumoto K, Koyama T, Hosomi M, et al. Diffusion tensor imaging in elderly patients with idiopathic normal pressure hydrocephalus or Parkinson’s disease: diagnosis of gait abnormalities. Fluids Barriers CNS. 2012;9(1):20. 21. Thomas G, McGirt M, Woodworth G, et al. Baseline neuropsychological profile and cognitive response to cerebrospinal fluid shunting for idiopathic normal pressure hydrocephalus. Dement Geriatr Cogn Disord. 2005;20(2-3):163-168. 22. Mataro M, Matarin M, Poca M, et al. Functional and magnetic resonance imaging correlates of corpus callosum in normal pressure hydrocephalus before and after shunting. J Neurol Neurosurg Psychiatry. 2006;78(4):395-398. 23. Raftopoulos C, Deleval J, Chaskis C, et al. Cognitive recovery in idiopathic normal pressure hydrocephalus. Neurosurgery. 1994;35(3):397-405. 24. Koivisto A, Alafuzoff I, Savolainen S, et al. Poor cognitive outcome in shunt-responsive idiopathic normal pressure hydrocephalus. Neurosurgery. 2013;72(1):1-8. 25. Gölz L, Ruppert F, Meier U, Lemcke J. Outcome of modern shunt therapy in patients with idiopathic normal pressure hydrocephalus 6 years postoperatively. J Neurosurg. 2014;121(4):771-775. 26. Pyykkö O, Lumela M, Rummukainen J, et al. Cerebrospinal fluid biomarker and brain biopsy findings in idiopathic normal pressure hydrocephalus. PLoS One. 2014;9(3):e91974. 27. Kazui H, Mori E, Hashimoto M, Ishikawa M, Hirono N, Takeda M. Effect of shunt operation on idiopathic normal pressure hydrocephalus patients in reducing caregiver burden: evidence from SINPHONI. Dement Geriatr Cogn Disord. 2011;31(5):363-370. 28. Iseki C, Kawanami T, Nagasawa H, et al. Asymptomatic ventriculomegaly with features of idiopathic normal pressure hydrocephalus on MRI (AVIM) in the elderly: a prospective study in a Japanese population. J Neurol Sci. 2009;277(1 -2):54-57. 29. Hashimoto M, Ishikawa M, Mori E, Kuwana N; Study of INPH on neurological improvement (SINPHONI). Diagnosis of idiopathic normal pressure hydrocephalus is supported by MRI-based scheme: a prospective cohort study. Cerebrospinal Fluid Res. 2010;7:18. 30. Calcagni ML, Lavalle M, Mangiola A, Indovina L, et al. Early evaluation of cerebral metabolic rate of glucose with 18F-FDG PET/CT and clinical assessment in idiopathic normal pressure hydrocephalus patients before and after ventricular shunt placement: preliminary experience. Eur J Nucl Med Mol Imaging. 2012;39(2):236-241. 31. Mataró M, Poca MA, Salgado-Pineda P, et al. Postsurgical cerebral perfusion changes in INPH: idiopathic normal pressure hydrocephalus: a statistical parametric mapping study of SPECT images. J Nucl Med. 2003;44(12):1884-1889.